Egg rolls fall into that category of food I find far too intimidating to tackle. Outside of the steady and practiced hand required to assemble these perfect little packages, my complete lack of familiarity with the flavors and seasonings of Chinese cuisine left me feeling unsure of where to start. After a fair amount of practice rolling spring rolls (find my favorite recipes here and here) and the nagging desire to finally dip my toe into the vast and varied world of Chinese cooking, I pushed my fear of failing aside, accepting that, as with many first time recipe attempts, the end result would be a burnt and broken mess of egg roll wrappers, not-quite-cooked-through filling and a grease-splattered stove. So I tentatively read a few recipes, bought my first bottle of fish sauce and set about assembling an approachable blend of ingredients for my first egg roll filling: minced shallots and garlic for a flavorful base, shredded carrots for a touch of sweetness, diced serrano peppers for heat and rice noodles to act as a binding agent of sort, a vehicle for sauce absorption wrapping and intertwining with large bites of shrimp and sausage. Tossed with fish sauce, sugar, soy sauce and lime juice, I held my breath as I sealed the filling into my first egg roll, cringing with anticipation, waiting for the wrapper to split, for everything to fall apart. To my surprise and delight the egg roll assembly proved to be simple and I was able to move along efficiently, pleased with the rhythm I soon found and the beautiful string of mini egg rolls lining up beside me. A quick fry and Z and I were crunching into these flavorful pockets, ample pieces of just cooked through shrimp and sausage supported by a base of salty-sweet veggies and noodles. With one recipe under my belt I am excited to immerse myself in this revered cuisine. Grand flavors await. 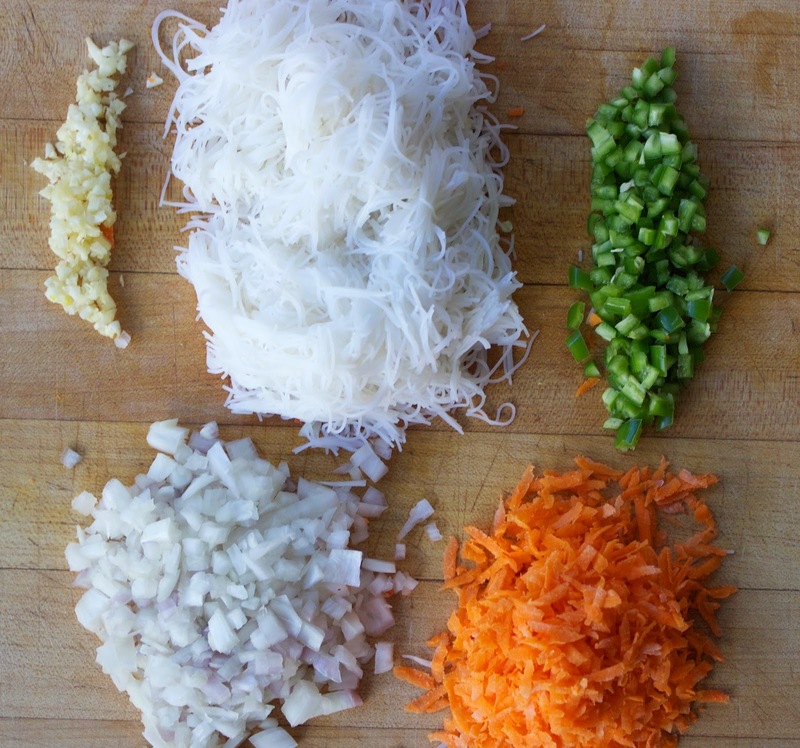 Place the following in a large bowl: one half cup minced shallots, two cloves minced garlic (approximately one and one half tsp), one half cup grated carrots (approximately one large carrot, grated), two serrano chills, minced, and five ounces rice noodles, cooked in boiling salted water for three minutes and strained, running under cold water to stop the cooking. Add one half pound peeled and deveined shrimp (rough chop, leaving plenty of large bites) and one half pound pork sausage to the vegetables and noodles. Pour two tbs fish sauce, two tsp sugar, one tbs soy sauce, one tsp freshly squeezed lime juice and one half tsp freshly ground black pepper over the vegetables, shrimp and sausage. Toss to combine thoroughly. Time to assemble! You will need to have an egg wash handy to seal the egg roll. Beat one egg with a splash of water. Place close to your assembly area, with a pasty brush handy for application. Egg roll wrappers generally come in squares. I like to cut them down the center, at a diagonal, forming two small triangles. With the base of the triangle facing toward you, brush the sides of the wrapper with the egg wash. Place a spoonful of the filling in the center of the triangle, toward the base. Fold both ends of the base of the triangle inward, sealing on top of one another. Carefully roll the base of the triangle away from you, pulling it up and over itself, pushing the filling into the packet and sealing the top of the triangle to the wrapper. Set aside and continue assembling the egg rolls. Fill a heavy-bottom pot with three inches of canola oil. Heat to 375 degrees and carefully place the egg rolls into the oil, being careful not to overcrowd. You will need to work in batches and to keep a close eye on the temperature of the oil. Each batch of egg rolls will cook in four to five minutes. 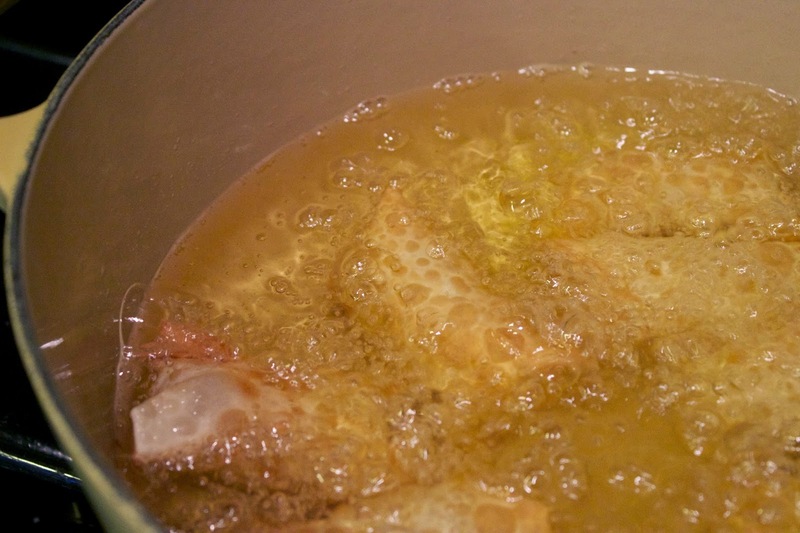 The temperature of the oil will drop when the egg rolls are added, however the more batches of egg rolls you fry, the hotter the oil will become over time. I have a candy thermometer and find it to be the best tool for tracking the temperature of my oil. Once crisp and brown, remove the egg rolls to a plate lined with a paper towel, allowing any excess grease to drain. 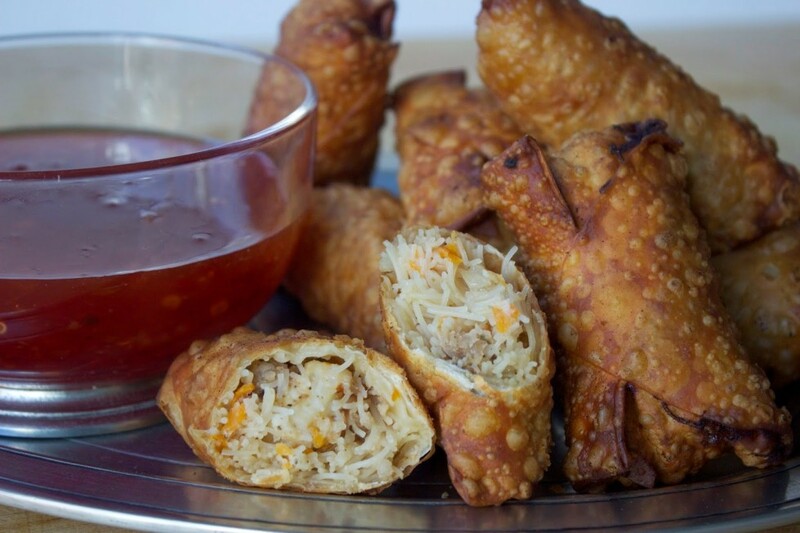 Serve the egg rolls with a sweet chili sauce for dipping. Enjoy! 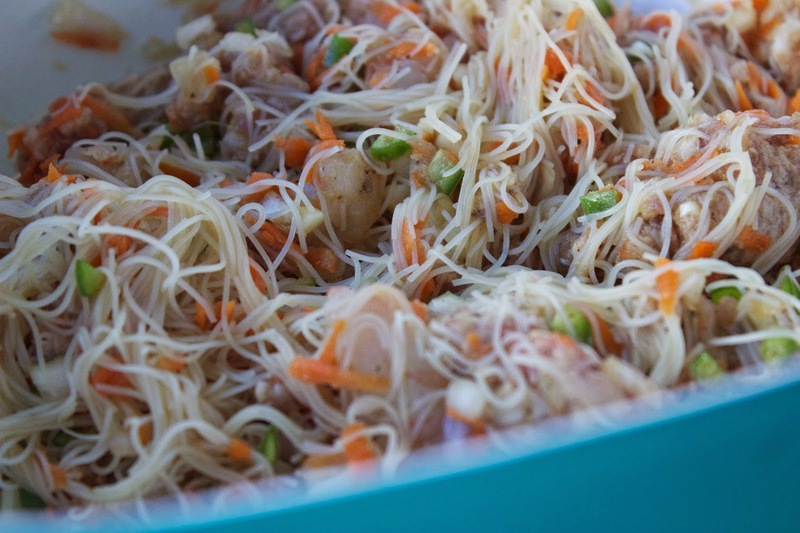 Place the shallots, garlic, carrots, serrano chills and rice noodles in a large bowl. 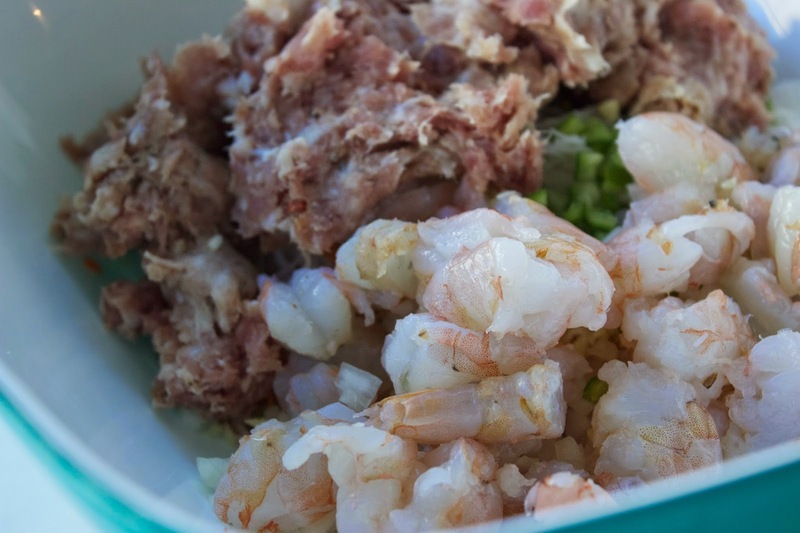 Add the shrimp, sausage, fish sauce, sugar, soy sauce, lime juice and black pepper to the bowl. Toss to combine thoroughly. Time to assemble! You will need to have an egg wash handy to seal the egg roll. Beat one egg with a splash of water. Place close to your assembly area, with a pasty brush handy for application. Egg roll wrappers generally come in squares. I like to cut them down the center, at a diagonal, forming two small triangles. With the base of the triangle facing toward you, brush the sides of the wrapper with the egg wash. Place a spoonful of the filling in the center of the triangle, toward the base. Fold both ends of the base of the triangle inward, sealing on top of one another. Carefully roll the base of the triangle away from you, pulling it up and over itself, pushing the filling into the packet and sealing the top of the triangle to the wrapper. 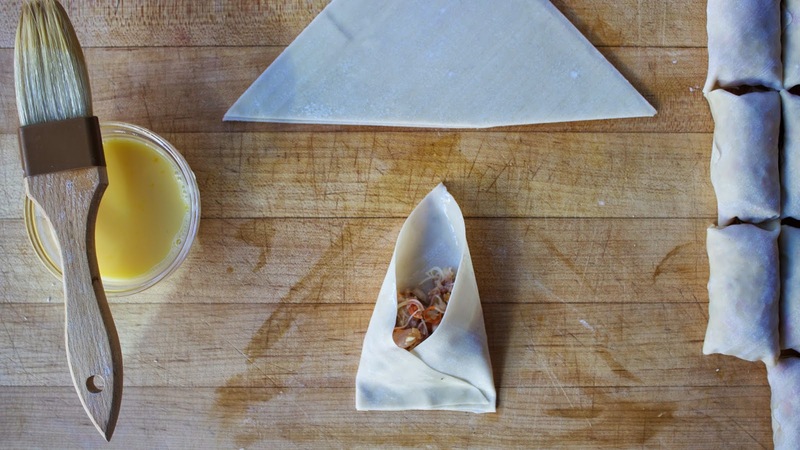 Set aside and continue assembling the egg rolls. Fill a heavy-bottom pot with three inches of canola oil. Heat to 375 degrees and carefully place the egg rolls into the oil, being careful not to overcrowd. You will need to work in batches and to keep a close eye on the temperature of the oil. Each batch of egg rolls will cook in four to five minutes. The temperature of the oil will drop when the egg rolls are added, however the more batches of egg rolls you fry, the hotter the oil will become over time. I have a candy thermometer and find it to be the best tool for tracking the temperature of my oil. Once crisp and brown, remove the egg rolls to a plate lined with a paper towel, allowing any excess grease to drain. Serve the egg rolls with a sweet chili sauce for dipping. Enjoy! What a fun take on egg rolls. I bet these wouldn't last long at a party!